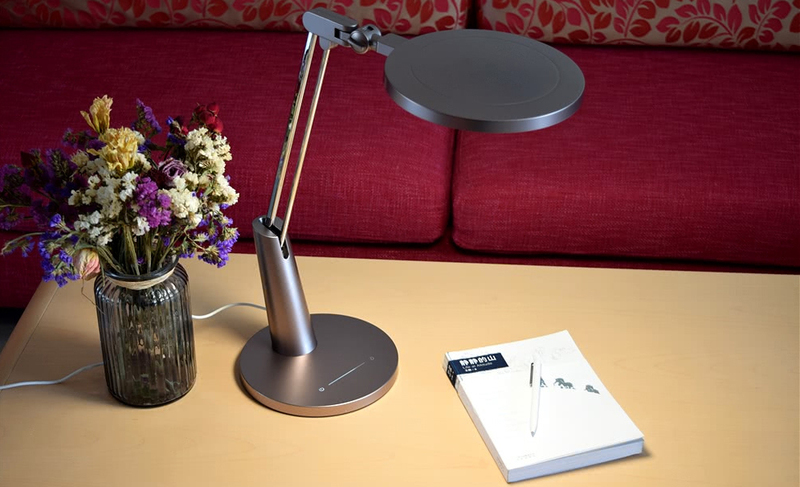 The Yeelight Pro desk lamp takes advanced LED technology to a new level of perfection. 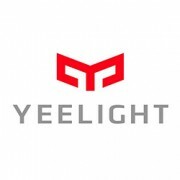 Featuring a fashion forward, highly ergonomic design that houses the cutting edge SunLike broad-spectrum LED technology from Seoul Semiconductor, Yeelight Pro delivers unparalleled color quality and vision performance that help create an unprecedented experience of comfortable, flexible and stimulating working environments. Offering ideal task lighting for home offices, children bedrooms, workstations, and beyond, this robustly constructed lamp brings a brilliant combination of technology, functionality, sustainability and design to the spaces that need it most. With a fingertip touch, Xiaomi Yeelight Pro lets you harvest a pleasing ambience that allows you to safely and productively engage in the tasks at hand..
Xiaomi Yeelight Pro offers the highest quality light for color-critical and reading intensive task lighting. Natural daylight is the perfect light source because it exhibits visible spectrum radiation at all wavelengths of the spectrum. It coincides with the human eye's visual acuity and allows the human eyes to reproduce the colors (and their shades and hues) of objects in view faithfully. Yeelight Pro takes advantage of SunLike natural spectrum LEDs to produce superior quality of light with the near identical color rendering of sunlight. Conventional phosphor excited LEDs are developed from the blue LED technology which utilizes cerium-doped yttrium aluminum garnet (YAG) yellow phosphor coating to convert light emitted by a blue InGaN LED die into white light. Such LEDs typically have narrow spectral bands and can not provide broad spectral illumination for high color rendering index and wide color gamut while maintaining high luminous efficacy. 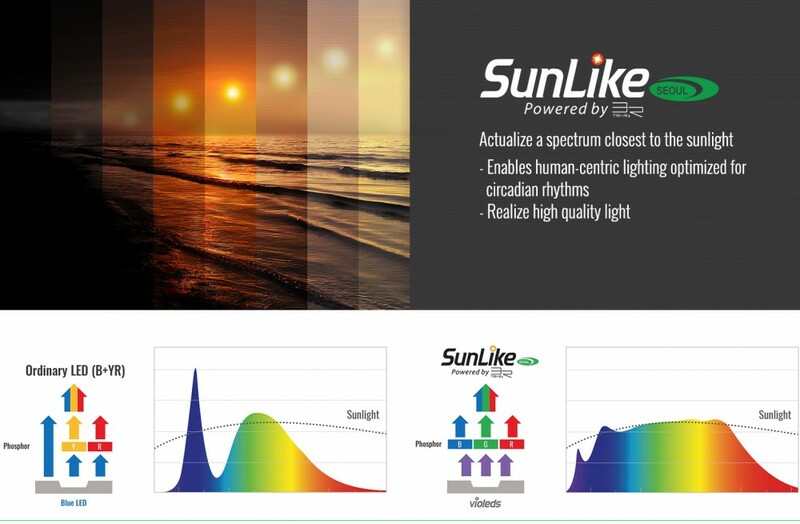 SunLike fundamentally transforms white light LED technology with a breakthrough, cost effective RGB approach in which purple LED chips excite Toshiba's TRI-R wavelength-converting phosphors to produce red, green and blue emissions for subsequent in-package mixing of broad spectrum white light. Compared with monochromatic-blue-excited white light LEDs, SunLike LEDs are a broadband light source with a visible spectrum coverage comparable to that of sunlight spectrum. The broadband light emission yields a full spectral power distribution that translates to extraordinary color reproduction. Delivering radiant power across the broad visible spectrum, Yeelight Pro LED lamps bring natural sunlight that human have enjoyed for thousands of years to your space. With an exceptional rating of 95 in both color fidelity evaluation systems - color rendering index (CRI) and color quality scale (CQS), Yeelight Pro creates visually pleasing light and enhanced ambiance with vibrant color rendition that brings out brilliant whites and dazzling colors. Yeelight Pro desk lamps which are equipped with SunLike LED technology relieve your eye safety concerns in near-field task lighting applications. The continuous, balanced spectrum of violet LED excited white light does not contain harmful ultraviolet rays or infrared light. In conventional LED packages the blue LED die is coated by a phosphor layer to convert all blue emissions into white light, this technology suffers from potential blue light leakage to human eyes due to either poor coating or premature degradation of phosphor materials although such chances are extremely rare. The blue light hazard is a photochemical damage of the retina due to high energy, short-wavelength radiation. 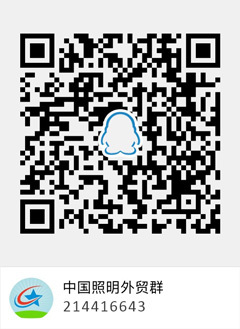 The SunLike violet LED based technology eliminates the concern of blue light leakage and minimize the blue light 'spike' that is characteristic of conventional LEDs. SunLike LEDs are grouped as RG-1 (Risk Group 1) light sources which poses no photobiological hazard under normal behavioral limitations. LEDs by their nature are not an ideal light source for desktop illumination. These discrete LEDs provide high intensity spot illumination that is inherently harsh and produces direct glare. The edge-lit design of Yeelight Pro LED desk lamps fundamentally addresses the light distribution problem of point light sources. The lighting system uses waveguide optical architecture to refract the beams produced from the edge of a round panel down towards a high-transmittance diffuser. Edge-to-edge illumination ensures light is evenly distributed across the entire span of this panel with no visible LEDs, hotspots, or shadows. The 15W Yeelight Pro desk lamp incorporate 88 SunLike LEDs to produces 650 lumens of soft, balanced light that is gentle on the eyes. The slim round panel provides a wide light coverage with illuminances of minimum 500 lux on the desk surface within a radius of 300mm. The 4000K color temperature of this lamp helps create a balanced ambience that promotes concentration and reduces fatigue and daytime sleepiness while maintaining a pleasant, inviting environment. Flicker is another major concern for LED lighting because LEDs typically operate on direct current (DC). Flicker occurs when the current that drives the LEDs does not remain constant over time. Flicker can evoke visual discomfort and health effects such as headaches, fatigue, eyestrain, blurred vision, migraines, and distraction. Yeelight Pro includes a built-in driver circuit that provide high performance load regulation for smooth dimming and flickerless lighting. The constant current driver has a ripple filter circuit that is designed to remove the ripples from a pulsating current which is rectified from AC power supply. Accurately controlled output current perfectly matches the electrical characteristics of the array of LEDs, thereby eliminating visible flickers occurring at a frequency of 100 or 120 Hz. 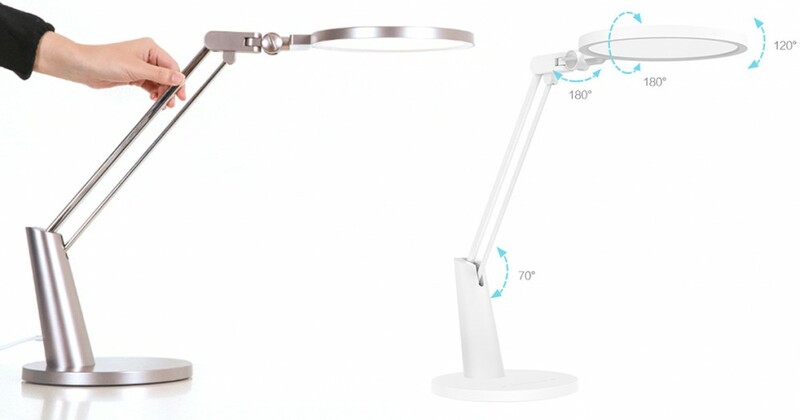 Yeelight Pro LED desk lamps are designed to provide the best possible ergonomics. Multiple self-locking articulated joints provide an infinite number of positions and extended reach for maximum reading comfort. 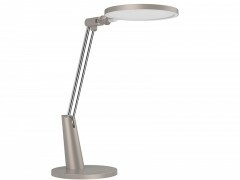 The double arm design ensures strong support of the light head. A cast-iron base provides added stability. Two highly sensitive touch switches at the base provides fingertip adjustability for on/off control and setting up eye-caring lighting mode. 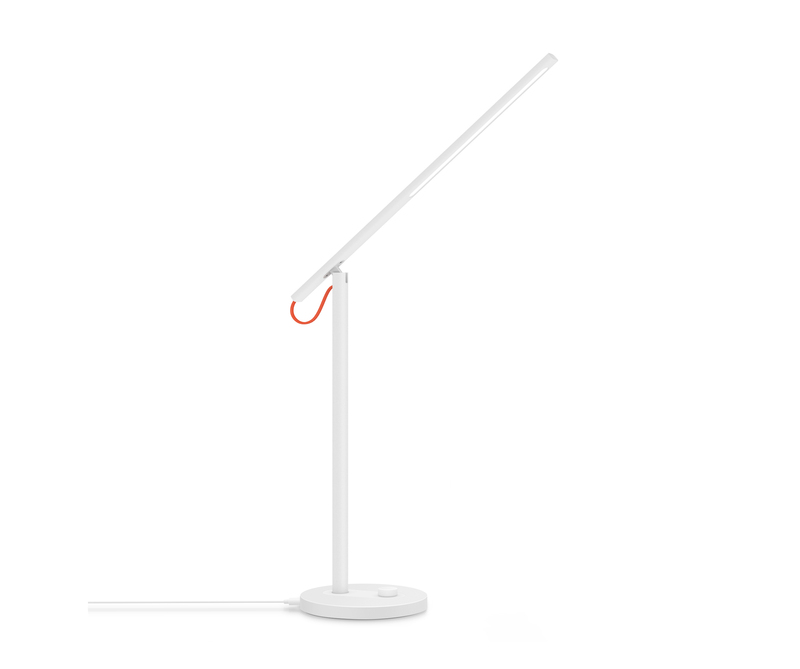 An embedded Wi-Fi radio allows you to control the smart desk lamp via the Mi Home app using your smartphone or tablet. A number of preset lighting modes can be scheduled in the app to spare your kids from visual fatigue. Yeelight Pro brings sleek sophistication to your home or office in a mocha gold finish which is powdercoated following a multi-stage intensive pretreatment process for lasting beauty. The desk lamp comes with a collection of cute animal stickers that are purposefully designed to embellish the lamp base for a playful look, making it a fantastic addition to igniting an enjoyable ambience for your kids' room! SunLike broad-spectrum LEDs provide high fidelity color rendering. Violet LED excited light, no blue light leakage and excessive blue light exposure concerns. Edge-lit design ensures uniform distribution of soft, visually comfortable light. High performance power electronics provide accurate load regulation for flicker-free illumination. Excellent thermal management prevents long life LEDs from lumen depreciation and chromaticity shift. Durable, ergonomically designed fixture delivering highly adaptable illumination. Wi-Fi connectivity (instant pairing), no hub or bridge needed. Intuitive app control with preset eye-caring lighting modes.